AIDA stands for attention, interest, desire, and action. This is a model which is used in marketing to describe the potential journey a customer might go through, before purchasing a product or service. From this first draft, other advertising pioneers, from Joseph Addison Richards to Fred Macey, Frank Hutchinson Dukesmith and others. An easy way to remember this formula is to call in the “law of association,” which is the old reliable among memory aids. It is to be noted that, reading downward, the first letters of these words spell the opera “Aida.” When you start a letter, then, say “Aida” to yourself and you won’t go far wrong, at least as far as the form of your letter is concerned. The message was clear. For an advertising message to work out, it had to “lift” a certain weight of the potential customer’s attention and interest before it could become a sale. Therefore, the AIDA model was supposed to give a clear framework to advertisers on how to carry the interest of a potential customer to become a sale. Thus, the AIDA model was the progenitor of the sales funnel. Since the dome of mass media, advertisers have fought for the conquest of a scarce asset: people’s attention. Any good salesperson knows this is the first step to take before it would be even possible to introduce the perspective of a sale. Advertisers first, and marketers, later on, have learned how to grab the attention of potential customers, before they could be presented with the option of completing a sale. In the AIDA model, the second step or phase is interest. A salesperson knows that before a sale could be closed, attention must be kept, by understanding what motivates the other part. Maintaining the level of interest in the prospect is another critical step in the AIDA model. Once attention is captured, and interest is maintained, the salesperson has to generate excitement. This phase is critical, as the salesperson has to be able to bridge the gap between action and interest before it could close a deal. That is when the transaction gets completed, and the sale happens. The sales people can trigger action by using several psychological levers, like scarcity, price or else. Does AIDA still make sense today? The problem with the AIDA model is that it assumes we live in a linear world, where people take deliberate steps before completing a transaction. This is true for all types of models that academic or practitioners use. However, the world is way more unpredictable, and the path people take before they become customers is hard to define in most cases. On the other hand, a model should have a specific function – I argue – which is allowing focus to whoever is using it. In short, practitioners should never fool himself to believe that the world follows the model she uses. But, she should use an AIDA model, to focus the effort on specific actions, to improve efficacy. In addition, the AIDA model might be not only unrealistic in many circumstances but also not appropriate for certain forms of selling. For instance, if you take a business model like SaaS or software as a service or a subscription-based model, those need to leverage on a continuous engagement of its customers or users, which implies a virtuous cycle or flywheel. This brings us to the post-AIDA models. To overcome some of the significant drawbacks of the AIDA model (such as not taking into account what happens after the sale) a few variations of the AIDA model have sprouted up. 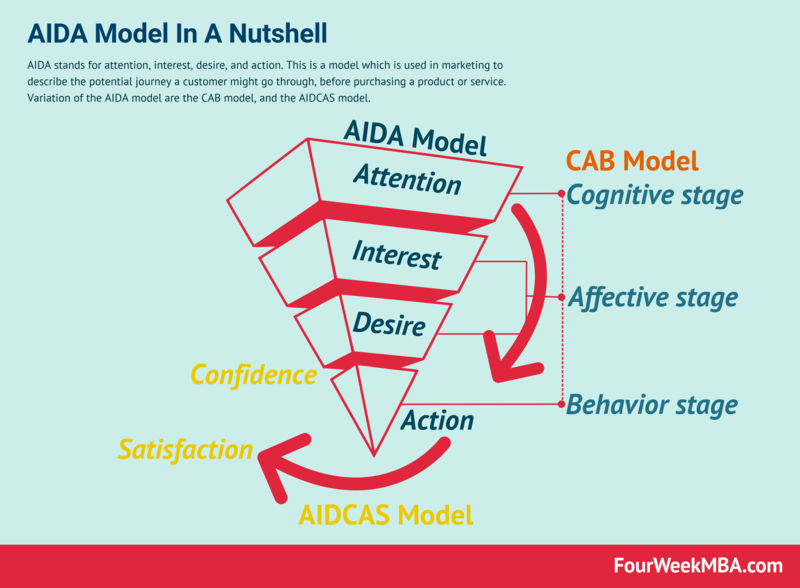 Some of them are the AIDCAS (where satisfaction and confidence are added to the AIDA MODEL); or the CAB (cognition, affect and behavior) Model which is the psychological equivalent of the AIDA model. Whatever sales model you decide to pick, it is essential to remark that they help salespeople and marketers to focus their effort!